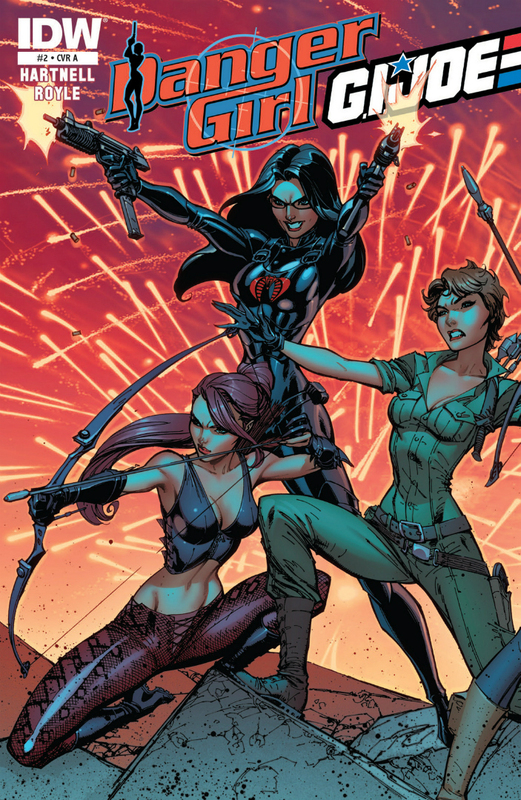 Scarlett and Flint are heading toward their execution, thanks to the newest Cobra recruit, Agent Chase. Meanwhile, the Joes meet up with the Danger Girl team. Andy Hartnell and John Royle bring us the second chapter of the Danger Girl/G.I. Joe team-up. It shouldn't be a surprise, with Danger Girl co-creator Andy Hartnell plotting this series, that the Joes not only get second billing in the title, but also in the story itself. That's not to say the Joes aren't getting a lot of “screen time.” But what we do see of them is rather passive and inept. Their role in this story so far is finding weapons over 6 decades old, getting captured by Cobra, and calling outsiders for help. On the other hand, Danger Girl has infiltrated the upper levels of Cobra, polished off a bad guy in a dashing, Bond-esque manner, and recognized an imposter POTUS on the Joe's own turf. Not a very balanced team-up. The story itself seems pretty formulaic so far. The Joes have powerful weapons, which Cobra steals and plans to use. Scarlett and Flint are captured and awaiting execution, but with the cartoony, light-hearted feel to this book, and the too-well-telegraphed identity of Agent Chase, there's no tension or intrigue to the plot. I was hoping that there would be something in the second issue that would finally pull me into the story. There wasn't. The one positive aspect to this story is its emphasis on the female characters. Joe-wise, we have Scarlett, Lady Jaye, Cover Girl, Jinx, the Baroness, and Zarana, all with relatively significant parts. Too bad none of them come off that well, or even as themselves. Since when would the Baroness be anything but mistrustful of and antagonistic to another Cobra officer, especially a female? Why the hell would LJ, CG and Jinx invite a group of operatives that Cover Girl only met briefly to board the USS Flagg during time of crisis (not to mention not clearing it first with a CO)? On the plus side, this is yet another Snake Eyes-free issue. John Royle's style doesn't work for this series, in my opinion. It's certainly not terrible, but the overly-cartoony and exaggerated features doesn't fit the atmosphere of a military/covert operations book. Often great artwork can save a mediocre book, but this is not one of those cases. Is Cobra, and Destro in particular, really interested in 60+ year old weapons with obsolete guidance systems? Danger Girl fans might appreciate this book more than I do, but with one-dimensional characters and generic plotting, I cannot recommend this book to anyone. Pass.